A free webinar by School Transportation News and bus wheelchair securement manufacturer Q’Straint/Sure-Lok provided answers to commonly-asked questions about safely transporting students in wheelchairs on school buses. The recorded webinar on Tuesday was led by Darren Reaume, national training manager for Q’Straint/Sure-Lok, and National Accounts Manager Chris Yarber. Over 150 questions were submitted, and the 10 most common were chosen to be answered in the live webinar, in addition to about another dozen asked by the audience during the event. A lack of knowledge of basic securement procedures results in incidents like that of a Creekside High School student tipping over while in her wheelchair, he noted. Non-self-tensioning retractors must be manually tightened, and automatic retractors must undergo the push-pull test. The rise of more nonstandard wheelchairs means that student transporters are running into obstacles when trying to secure them. Reaume advised following the three essential components and prioritizing the 45-degree angle. Webbing loops can be used if hooks cannot be fitted to the wheelchair. Yarber said that the same principles that are used with scooters can be used on power wheelchairs: Attach securement straps low and tight on the center seat post, secure close to the seat and prioritize belt angle over solid frame member. Yarber advised against common mistakes, like: securing the wheelchair sideways, attaching securement belts to crossbars in the middle of the wheelchair, or attaching the belts too low on the chair. Crossing or twisting the rear securement belts also compromises their safety. A quarter-turn is the maximum recommended twist to allow. Wheelchairs that meet WC19 standards are crash-tested and certified to essentially turn the chair into the equivalent of any other seat on a school bus, Yarber explained, but only if designated securement points are used. He also cautioned to look out for look-a-likes, since the “hook” symbol to the right is the only one that is used to designate such securement points. The most recent industry best practice standard for wheelchair securement, WC18, became effective in January 2016. The rule updated requirements for integrating lap and shoulder seat belts with WC19 wheelchairs. 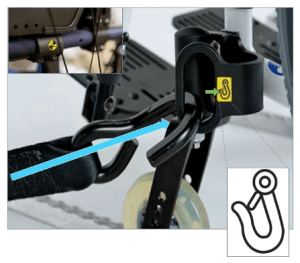 If you have WC18 retractors, use the lap belt on a WC19 wheelchair, Reaume said. If the wheelchair is not WC19, you must use a complete lap/shoulder occupant restraint, he noted. 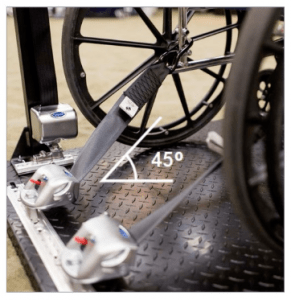 Both Yarber and Reaume stressed that securement points on non-WC19 wheelchairs must always be thoroughly evaluated. Wheelchair parts must not be used, just because they look like a WC19-certified securement point. Properly securing occupants in their wheelchair is also important, Reaume said. The lap and shoulder belts must be properly positioned and be snug against the body, with the red release buckle on the aisle side. The shoulder belt should be moved back if the wheelchair reclines, to ensure a better fit for the passenger. National minimum standards published by the National Conference on School Transportation now require a height adjustor to be available, if needed. Different wheelchairs or additional equipment needed by the student may pose difficulties, Yarber said, but manufacturers always advise using all three components of the tiedowns, as well as lap and shoulder occupant restraints. To help make things easier in these situations, student transporters can add additional securements, or switch to WC18 retractors. Q’straint crash tests for 30 mph and 20G frontal impact, conditions that are much more severe than most routes will encounter. “Incidents generally happen because of improper securement, not failing equipment,” Reaume revealed. Training is key for both drivers and management, and Q’straint’s recently released Training Academy features on-demand training courses and free webinars that also include certificates of completion. After the webinar, more attendee questions were addressed. Long wheelchairs may require overlapping of securements to achieve the correct 45-degree angle, Reaume said. Yarber advised working with the bus manufacturers to make sure they are building the bus to district needs, not just minimum specifications. Webbing loops—which come from the bus dealer, not securement providers—should either be used with all four, or with none of the securement straps, Yarber recommended. Additionally, securement straps should be removed from the school bus floor when not in use, to avoid creating a tripping hazard. The University of Michigan Transportation Research Institute provides more instruction and resources on proper wheelchair securement aboard school buses.